IAAF president Lord Coe is to be questioned by MPs on Wednesday about blood doping in athletics. He will give evidence to the culture, media and sport select committee, which is investigating doping in the sport. Before the hearing, committee member Damian Collins MP said: "There needs to be more humility from the IAAF." Russia was banned from international events after an independent World Anti-Doping Agency (Wada) report alleged "state-sponsored doping". Collins said that Coe "needs to recognise that there have clearly been problems with the way doping issues have been dealt with in the past". The Conservative MP said he wanted to hear whether Coe will "set up an independent body to manage doping as cycling has done". Coe ended an ambassadorial paid role with US sportswear giant Nike last week after conflict of interest claims. It follows the awarding of the 2021 World Athletics Championships to Eugene, Oregon - which has close connections to Nike - without a bidding process. On Monday three Kenya Athletics officials, including president Isaiah Kiplagat, were provisionally suspended by the ethics commission of the IAAF, which is looking into allegations of "subversion" of the anti-doping process in Kenya and "improper diversion" of funds received from Nike. Coe was elected International Association of Athletics Federations president in August, succeeding Lamine Diack who is being investigated by French police over allegations he took bribes to cover up positive drugs tests when in charge of the sport's governing body. What questions will Lord Coe face? 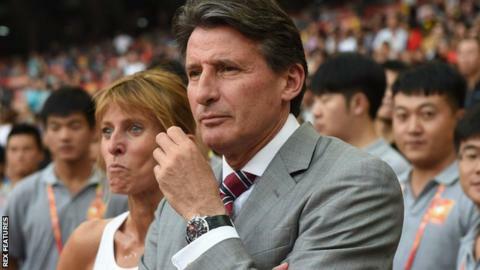 The IAAF president will be questioned about the organisation's response to doping allegations, including Lord Coe's claim that a Sunday Times investigation into suspicious blood results amounted to "a declaration of war on my sport". Coe's delay in ending a 38-year association with Nike is almost certain to be discussed, while Collins says "there are still questions to answer about the awarding of the Eugene 2021 World Championships". A BBC investigation on 24 November revealed emails suggesting that when Coe was vice-president of the IAAF, he lobbied former president Diack with support for Eugene. Coe has told the BBC he "did not lobby anyone" over Eugene's bid, but "encouraged them to re-enter another bidding cycle as they had a strong bid". Collins told The Times: "The big question is, given he is part of the old guard, is he the right man to lead the IAAF in a radical, new direction? He has to demonstrate that, although he was an IAAF insider for a long time, he is prepared to do whatever it takes." Coe will also be questioned about receiving £63,000 from UK Sport to pay for his PR team as part of his IAAF presidential campaign. What has he said already? On allegations drugs cheats escaped bans when bribes were allegedly paid to the heads of world athletics: "That people in our sport have allegedly extorted money from athletes guilty of doping violations is abhorrent." On ending his association with Nike: "The current noise level around it is not good for Nike or the IAAF; a distraction to the 18-hour days we are working to steady the ship." On how he intends to fight doping in athletics: "Those who cheat will be caught and those who are caught will be thoroughly investigated and the guilty will face the fullest sanctions available. We have to make sure clean athletes know that we are in their corner and I will do everything I possibly can to make sure we rebuild trust in this sport." What about 'a declaration of war on my sport'? The select committee called Coe to Parliament after his "declaration of war" comment. In August, the Sunday Times published data of 12,000 blood tests from 5,000 athletes, which it had reviewed by scientists and said revealed an "extraordinary extent of cheating". Can we expect anything else? The hearing on Wednesday will be covered by parliamentary privilege, which gives MPs and Coe the freedom to give evidence and make allegations without the risk of civil or criminal proceedings as result of what is said. The select committee chairman, Jesse Norman MP, was accused by women's marathon record holder Paula Radcliffe of implicating her in blood doping allegations in September when he suggested London Marathon winners and medallists and "potentially, British athletes" were under suspicion. Radcliffe, who was not named by Norman, said at the time it was "profoundly disappointing that the cloak of parliamentary privilege has been used to effectively implicate me". Norman said his comments were "taken out of context". Last week the IAAF and the UK Anti-Doping agency found Radcliffe innocent of blood doping. The IAAF said Radcliffe had been "publicly accused of blood doping based on the gross misinterpretation of raw and incomplete data". The committee has previously taken evidence from Dr Michael Ashenden, one of two scientists used by the Sunday Times and German broadcaster ARD to analyse the leaked IAAF data. He and Dr Robin Parisotto concluded that hundreds of athletes had recorded suspicious results between 2001 and 2012 which were not followed up. Last week the IAAF said the allegation it ignored suspicious results was "based on bad scientific and legal argument". Dr Ashenden responded to the IAAF statement by describing it as a "disgraced federation" and said of Coe: "He was particularly vocal about my criticism of the IAAF, and defended its anti-doping department. I say the IAAF failed their athletes. Let's wait and see who is sitting on the right side of history." Conservative MP Norman said: "Recent events have further underlined the seriousness of the issues raised by blood doping in sports, and the depth of public concern about them." Collins, who has also campaigned for reform at football's world governing body Fifa, tweeted last week: "The IAAF should spend less time declaring war on their critics and more recognising the scale of the crisis world athletics faces." The committee hearing is due to start at 14:15 GMT.